Christmas Light Tours are a great way to get out and explore the city. Whether you are entertaining guests from out of town or just playing the “Hometown Tourists”, these tours can be a great addition to your holiday season. Get your tickets quickly for these tours! They will definitely sell out early. A Franklin holiday tradition continues! Buy tickets today for the Holly Trolley event. Departure will be from the Transit Center in historic Downtown Franklin located at 708 Columbia Avenue, Franklin, TN. During the event, the beautiful holiday light displays throughout Franklin and the surrounding areas in Williamson County will be featured. A wonderful holiday event for family and friends! Prepayment is required for this event, which is always a sellout, so buy your tickets today! The event will feature a stop at The Historic Lotz House built in 1858 in historic Franklin featuring a look at Christmas Past in Franklin. Participants will be treated to delicious holiday refreshments. The event will feature the beautiful light displays in the Franklin and Williamson County area. Trolleys depart promptly. The Holly Trolley trip lasts approximately 75-90 minutes. Tickets are $18 and can be purchased online via this link. Tickets: $25 per seat. Lap children at no charge Purchase tickets online at this link. New for 2018 – Franktown Festival of Lights included in tour! Tours Run 1 hour and 30 minutes in and around Franklin & Brentwood. Tours will begin outside the The Factory at Franklin Building 11. Sunday December 9 Tours begin at 4:30PM. Last tour at 8PM. Carriages leave every half hour. Reservations must be made in advance. Use this link to reserve your spot. INDIVIDUAL TICKETS are $23.50. Children under 2 may ride on a parent’s lap for free. 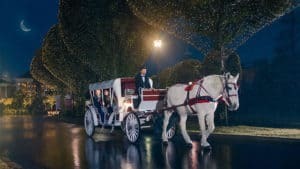 Take a horse drawn carriage ride and see the lights and decoration at Gaylord Opryland. Ride is around 12 minutes long. Rides begin daily at 5PM. Ending times vary depending on day. See full schedule and purchase tickets at this link. Every Christmas season, the residents of Nashville go all out in displaying their holiday cheer, and this Nashville Christmas Lights Tour offers a vibrant look at the spirit of the season through Nashville’s decorative light displays. The Christmas Lights Tour of Nashville is one of the most amazing ways to experience Music City USA. You will find that this tour option provides you with an excellent experience and provides all the holiday cheer that you demand. The Nashville area is home to some of the grandest neighborhood Christmas lights displays in the mid-South, and with this tour, you can travel from the more well-to-do neighborhoods to lone estates of the stars to see the vibrant displays. You will board a modern motor coach and enjoy a professional tour guide throughout the tour. During this 2.5-hour tour of Nashville and the surrounding area, you will see a variety of grand light displays with everything from animatronics set-ups to over-the-top residential displays and even more, perfectly complimenting this special time of year! You will experience a wide variety of light displays, from simple, elegant lights to fully animated displays and more. Each display is a wonder, created specifically to honor the Christmas season through expressions of popular Christmas tales and religious meaning, as well. Travel through Franklin, one of Nashville’s southern suburbs. There, you will experience the historic town square and see the town that was the location of the Battle of Franklin in 1864 during the Civil War. Observe the Civil War Lotz House, which houses the finest Civil War era antiques in the South and was added to the National Historic Register in 1976. Located in the center of Franklin, the Lotz House was the epicenter of the Battle of Franklin during the war, and now, the house is decorated in keeping with a typical Christmas in the mid-1860s. It is truly a Tennessee holiday tradition! This tour is one of the best ways to get into the holiday mood and ensure that your visit to Nashville is as enjoyable as possible. Come find out why Nashville is about more than just amazing music with this stunning tour, sure to light the fire of Christmas in your heart. Book tours online via this link. Enjoy the festive sights and even sounds of some of Nashville’s best Holiday decorated homes and businesses this Christmas season. You will ride in one of our stylish and luxurious limousines that is festively decorated and furnished with cider, eggnog and Holiday treats. Sing Christmas carols on our karaoke systems or stay comfortable by the yule log burning on our virtual fireplace all while viewing the entries on the Ann Chapman Holiday Lights Contest. We have designed customized routes based on your pick-up location so that you will see Christmas lights within 15 minutes of your start time. We can take you to see the lights and Opryland and stop for photo opportunities. The 2018 Dancing Lights of Christmas and Chad’s Winter Wonderland. What we enjoy most are the beautiful neighborhood Holiday lights all around Nashville. Like the downtown Christmas trees and Franklin Square. We know Holiday lights, with ith this being our “ninth season” you’re guaranteed to see the best home light tour. Our Chauffers are trained at taking the Holiday family pictures this is your own private limousine Decorated for the Holidays. Servicing residential pick-up all of Davidson County, Brentwood, Franklin, Hendersonville and Mt. Juliet. Pick-up locations other than those mentioned will have designated pick-up area. Price quotes available at this link. Tickets are $34 for Adults and $24 for Kids age 17 and under and may be purchased via this link. Want to explore on your own? 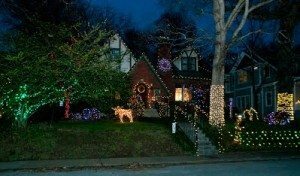 Check this list of Christmas Lights Displays in Nashville and Middle Tennessee. And you can find more holiday fun in our Nashville Christmas Guide!